Amazon in September quietly acquired voice-to-text company Yap a buyout that was recently revealed in the company’s financial filing. While Amazon is not directly named in the filing the company is said to have been purchased by an organization located inside an Amazon-owned building. Details about the buyout have not been revealed but it’s believed that Amazon will use the technology to compete with Apple’s Siri voice assistant technology. In other Amazon news the company on Wednesday revealed several popular application options including Angry Birds and Facebook while announcing that the Amazon App Store for the Android based tablet will debut soon in the US and allow users to pay for apps using their existing Amazon account. If that isn’t enough reason for many potential customers to buy the Amazon Kindle Fire the company also says they will soon debut Netflix, Twitter, and Zynga Games apps for the system along with offerings from Electronic Arts. 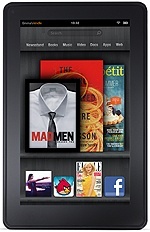 Amazon is currently using the Amazon Kindle Fire as a “loss leader” as they sell the Android tablet based system for just $199.99.